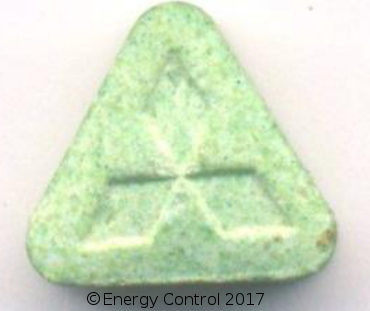 The Mitsubishi print is one of the most well known presses of ecstasy tablet, dating back to the 1990s when MDMA first became popular. Many batches of the tablets have been produced over the years in varying quality but generally at the lower end of the spectrum because sophisticated manufacturers do not want their products tainted by the hit-and-miss reputation of the logo. 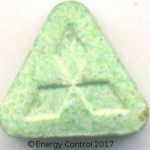 This year brings nothing different, and the Spanish testing service, Energy Control, have detected a green mitsubishi pill which contains a cathinone stimulant called a-PVP with no trace of MDMA. This is easily detected with reagent tests as a-PVP gives no colour change for the reagents in the MDMA test multipack whereas MDMA goes black with all three. a-PVP* is a stimulant and does give energy like MDMA but the comparisons pretty much stop there. It is most similar to cocaine but has a much longer uncomfortable “tail” after the main high ends and a much higher chance of causing paranoia. The lack of enjoyable effects can easily lead to people taking a couple because they’re getting something and think it’s just a weak pill but this can result in sleep being prevented for much longer than MDMA would, and this sleep deprivation can further feed into the risk of paranoia and psychosis. You can see the image Energy Control provided below. The tablet is 4.9mm thick and 9.9mm wide with a mass of 422 mg. The amount of a-PVP inside is not known. You can see the original post by Energy Control in Spanish here. This is a great reason why trying to determine what’s in a pill by asking if people have taken one with the same design is really never a good idea. a-PVP may not be common but counterfeiting is rife and it only takes a couple of months for fakes to emerge – this is why pill logos change so often, so that sophisticated manufacturers don’t have their reputations hurt by dodgy bedroom presses. *a-PVP is sometimes called “flakka” by american media but this appears to have been made up by the media and has also been used to describe other stimulants.